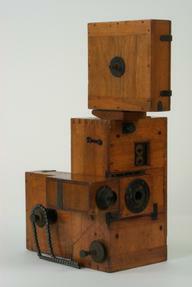 Devised a viewer-projector for chronophotographs, and invented the 'beater movement' mechanism used for film projection. As assistant of E-J. Marey from 1882, Demeny photographed human and animal movement using sequential photography – chronophotography. They used glass plates and later moving plates or filmstrips. In 1892 Demeny patented the Phonoscope with glass discs for projection (and paper discs for direct viewing) and formed a company to sell the invention. This was without Marey's approval who dismissed him in 1894. At this time Demeny invented a camera with the ‘beater’ mechanism to move the film on. A year later he joined Leon Gaumont to sell the Phonoscope which was renamed as Bioscope and in 1896 commercialized the Biographe cine camera. Demeny’s Phonoscopes were unsuccessful because of the greater technological developments of Luminere and de Bedts. However Gaumont continued to successfully exploit the invention of ‘beater movement’ whilst Demeny returned to gymnastic work.